This litter solution is free of fragrances and dyes, making it an ideal option for cats and pet parents who prefer unscented litter. Let your cat paw her way through this litter, and watch as she purrs in appreciation after each use. 99.9% dust free. In the case of factory defects, we will replace the product for you. We do our best to process as quickly as possible. Each pad quickly absorbs urine that passes through the BREEZE litter pellets, keeping your cats dry and comfortable inside their litter boxes. Encouraging your cat to use an indoor litter box, or properly disposing of outdoor cat feces, is beneficial to overall water quality. Each pad quickly absorbs urine that passes through the BREEZE litter pellets, keeping your cats dry and comfortable inside their litter boxes. The pads are conveniently disposable, making cleanup easy. NEW Tidy Cats Breeze Cat Pads Pads Control Refill. Condition is New. Shipped with USPS First Class Package (2 to 3 business days). Unlike traditional clay litter, Breeze uses specially designed litter pellets that are 99.9 percent dust free. The urine is quickly absorbed leaving solid waste on top for quick, easy removal. 99.9% dust free! The extended release deodorizing system can help you maintain the litter box for up to a week easily. A Closer Look: You can use Tidy Cats Non-Clumping 24/7 Performance for busy cat boxes. Tidy Cats Non-Clumping 24/7 Performance. These liners enable quick and convenient changing. They are carefully made to conform to the shape of most design boxes. Mild scent prevents bad odor and leaves behind a fresh scent. These liners can be easily installed by just placing the cat box inside the liner and folding the liner around. This makes scooping the litter quick and easy. Designed to dehydrate solid waste, these litter pellets help to keep your cats' litter boxes clean and tidy. They are formulated for multiple-cat households, so your feline family is happy and willing to make use of their cat corner. Change the way you think about cleaning your cat's litter box with the Purina Tidy Cats BREEZE Litter System starter kit. With the pass-through automatic litter box system, the pellets capture solid waste on top, letting urine pass through to the absorbent litter pads below. Size:12 lb. Pail | Style:24/7 Performance | Product Packaging:Standard Packaging Lighten your load as you maintain your cats' litter boxes with Purina Tidy Cats LightWeight 24/7 Performance clumping litter. The powerful triple-odor protection defends your home against strong smells. The lightweight formula weighs half as much as leading clumping litter for cats, making it easy to carry. With an Ammonia Blocker that keeps ammonia odor from forming for at least two weeks when used as directed, this kitty litter provides protection from lingering smells. The tight clumps allow for convenient scooping, so litter box cleaning is simple. TidyLock protection helps lock away odors, and the 100% dust-free formula means the litter pours cleanly. Size:17 lb. A powerful Ammonia Blocker prevents ammonia odor from forming for at least two weeks when used as directed. With Glade Tough Odor Solutions, this clumping cat litter defends against strong scents, leaving behind a fresh fragrance. Each pad quickly absorbs urine that passes through the BREEZE litter pellets, keeping your cats dry and comfortable inside their litter boxes. Absorbs urine to help keep your cats dry. Item model number: 12837. 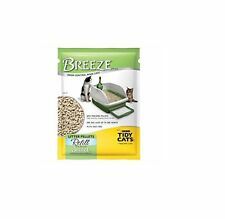 Size:(6) 10 ct. Purina Tidy Cats BREEZE Litter System Cat Pad Refills. Absorbs urine to keep your cats dry. Need your item quicker?. This makes scooping your BREEZE litter system quick and easy. Designed to dehydrate solid waste, these litter pellets help to keep your cats' litter boxes clean and tidy. They are formulated for multiple-cat households, so your feline family is happy and willing to make use of their cat corner. With Glade Tough Odor Solutions, this clumping cat litter defends against strong scents. The 100% dust-free formula prevents litter clouds from forming. This product does not protect user or others against disease-causing bacteria. It's formulated without harmful chemicals, making it a safe, nontoxic litter option that won't harm cats if they happen to ingest it. Pets Cats Purina Tidy Cats Cat Litter. US electrical systems run on 110v, most foreign electrical systems run on 220v. Purina Tidy Cat Litter Instant Clumping Odor Action 14 lb. Jug Multiple Cats Use. Type: Cat Litter. Formulated for multiple cats. Animal Type: Cat. However problems do happen Color: Multicolor. Manufacturer Part Number: 11716. Strong clumping action makes scooping each box a quick and easy task. With hassle-free cleanup and a simple-to-use form, this clumping cat litter lets you check litter maintenance off of your pet parent to-do list each week. Odors are instantly neutralized in even the busiest of multiple cat litter boxes, while the strong clumping action makes clean up fast and easy. 99.6% dust free. Tidy Cats Tidy Cats Clumping Litter 24/7 Performance for Multiple Cats 35 lb. TheTidy Cats 24/7 Performance Scoop Cat Litter for Multiple Cats gives you the power of around-the-clock odor protection so you don't have to be reminded of the litter box's presence. You want high-speed freshness that’ll stay a while. And so does Tidy Cats Instant Action. Extended release deodorizing system. Bring a natural, Earth - friendly solution to your cat litter needs with Purina Tidy Cats Pure Nature Cedar, Pine & Corn clumping litter for multiple cats. This natural cat litter features a combination of cedar, pine and corn, so you can feel good about the products you use when caring for your cats. This kitty litter is half the weight of the leading clumping litter, making it easy to carry to your cats' litter areas whenever you need to refill their boxes. Purina Tidy Cats Light Weight, Dust Free, Clumping Cat Litter; LightWeight 4-in-1 Strength Multi Cat Litter - 17 lb. This clump and seal cat litter, formulated for multiple cats, creates an inviting atmosphere for your cats, no matter which litter box they choose. Show your cats you are just as fond of them as they are of you by ordering Purina Tidy Cats kitty litter at. Purina Tidy Cats Clumping Cat Litter; Instant Action Multi Cat Litter - 35 Lb. Encouraging your cat to use an indoor litter box, or properly disposing of outdoor cat feces, is beneficial to overall water quality. Open containers may present a remote safety risk to unattended cats or dogs. With Glade Tough Odor Solutions, this clumping cat litter defends against strong scents, leaving a fresh fragrance behind. Animal Type: Cat. However problems do happen Color: White. Powerful clumping action for easy cleanup. Encouraging your cat to use an indoor litter box, or properly disposing of outdoor cat feces, is beneficial to overall water quality. Open containers may present a remote safety risk to unattended cats or dots. Tidy Cats Glade Tough Odor Solutions Clear Springs Clumping Cat Litter - 20 Lb. With Glade Tough Odor Solutions, this clumping cat litter defends against strong scents, leaving a fresh fragrance behind. Give her the quality she deserves in her cat litter box with Purina Tidy Cats. Size:(4) 7 lb. This makes scooping your BREEZE litter system quick and easy. Designed to dehydrate solid waste, these litter pellets help to keep your cats' litter boxes clean and tidy. They are formulated for multiple-cat households, so your feline family is happy and willing to make use of their cat corner. Strong clumping action makes scooping each box an easy task. With hassle-free cleanup and a simple-to-use form, this clumping cat litter lets you check litter maintenance off of your pet parent to-do list each week. Absorbs urine to keep your cats dry. We PROMISE we can make you happy if you give us a fair chance. Powerful clumping action for easy cleanup. Encouraging your cat to use an indoor litter box, or properly disposing of outdoor cat feces, is beneficial to overall water quality. Animal Type: Cat. However problems do happen. Breeze cat pads are easy to maintain and odor free. The specially-designed Breeze litter pellets allow urine to pass through to the Breeze cat pad underneath, while leaving solid waste on top for quick, easy removal. A powerful Ammonia Blocker prevents odor from forming for at least two weeks when used as directed. This clumping cat litter defends against strong scents, leaving behind a fresh fragrance. One (1) 17 lb. Purina Tidy Cats 24/7 Performance Multi-cat Non-Clumping Cat Litter, 30 Lb. With no clumping, this cat litter makes cleaning each litter box quick and simple. Fill each cats' litter box with this Tidy formula, and let them know you care about their personal care and happiness. The specially-designed Breeze litter pellets allow urine to pass through to the Breeze cat pad underneath, while leaving solid waste on top. The Breeze Litter System makes life clean and easy. The Breeze Cat Pads absorb urine and odor for up to one week in the tray below. Four (4) 10 lb. 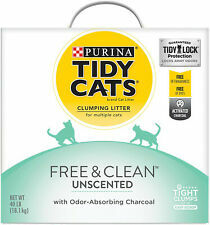 Bags - Purina Tidy Cats Instant Action for Multiple Cats Non-Clumping Cat Litter. Non-clumping for easy litter box maintenance. Absorbs urine to keep your cats dry. Tidy Cats Breeze Litter Pellets, 7 lbs.